Try the latest development version from http://dolphin-emu.org/download/ . As of this writing the latest is 3.5-1320. There have been a ton of stability fixes since 3.5, so maybe this game was one of them? Could you post a small video to show us what your issue looks like? (05-04-2013, 09:16 PM)MaJoR Wrote: Try the latest development version from http://dolphin-emu.org/download/ . As of this writing the latest is 3.5-1320. There have been a ton of stability fixes since 3.5, so maybe this game was one of them? 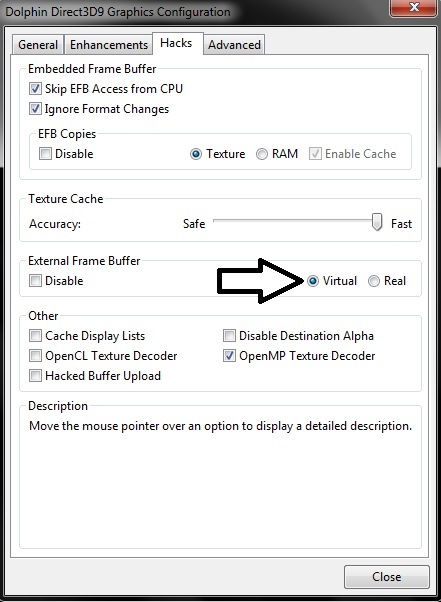 Use the "External Frame Buffer" option, either "Virtual" or "Real". (05-05-2013, 12:23 AM)Starscream Wrote: Use the "External Frame Buffer" option, either "Virtual" or "Real". How would I make it stick each time the game starts up? Without having to change the settings globally, each time. (05-09-2013, 06:55 PM)Lebada3 Wrote: How would I make it stick each time the game starts up? Right Click on ISO -> Properties -> Edit Config ? And then where exactly would I place those two lines? Quote: [Core] Values set here will override the main dolphin settings. [EmuState] The Emulation State. 1 is worst, 5 is best, 0 is not set. [OnFrame] Add memory patches to be applied every frame here. [ActionReplay] Add action replay cheats here.